If you’re a professional moving to another region or visiting on an extended stay, it’s important to you will have a good network connection available and a place you can work with. Here in Puerto Vallarta, we offer a few options for locals and travelers alike to come & work in a quiet, professional space with strong WiFi & great people. When it comes about finding a space where you can work in peace without being disturbed by different factors, then you have to look for a place where people come and do the same thing as you. 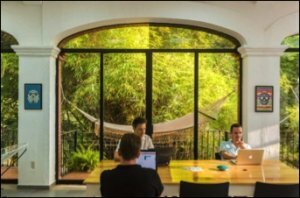 There are a few coworking buildings specially designed for people who come to work in a common space in Puerto Vallarta called Vallarta CoWork & their sister company Natureza. The firms that own such places make sure you have a great internet connection so you can download or upload as fast as needed. They will give you wireless access during the entire working day so you shouldn’t worry about losing your work because of the lack of proper internet connection. Puerto Vallarta is a very hot region situated near the Pacific Ocean, sometimes especially hot during the summer. If it is too hot outside, the coworking space will always have proper temperatures for their clients to feel relieved with air conditioning and outside hammocks for your comfort. If you need to get your entire team together for a special meeting, then the Coworking space will provide you with the necessary meeting area that is quiet and professional. There are multiple meeting rooms you can choose from in order to find the most suitable one for both you and your team. If you‘re tired of getting your papers at home every night, they offer special lockers you can keep them in. You are the only one who has the key so you work will always be safe. There so many features offered and the fees are really small. You can spend a day here starting with $10 and enjoy the comfort of such a great place. Start working in a peaceful environment at Vallarta Cowork and you will never regret it.